California Milk Processor Board Threatens PETA with trademark infringement over "Got Pus?" After years of allowing numerous parodies (and even some similar third party trademark registrations) of its famous "Got Milk?" trademark, the California Milk Processor Board ("CMPB") is threatening to sue People for the Ethical Treatment of Animals ("PETA") over its use of the phrase "Got pus? Milk does." on T-shirts, mugs, and other merchandise. See Associated Press article here. 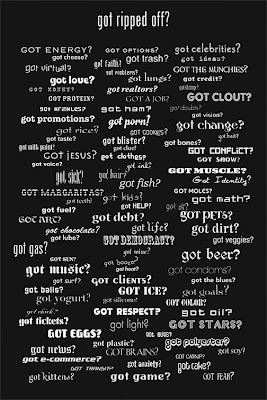 Your client cannot seriously contend that an appreciable number of consumers who see a T-shirt bearing the "Got Pus? Milk Does" slogan would be confused into thinking that your client is the source of the T-shirt, attempting to sell milk by letting the public know that when they drink milk they are also consuming pus. So apparently, CMPB is ok with the myriad of "Got Milk?" ripoffs -- so long as you don't bash milk.